What started as a dorm room hobby, margo.rebecca jewelry has evolved into an emerging brand with a very loyal following in less than a year with the designs already available in ten cities (!) with customers ordering throughout the country. Margo Libby is the founder and creative director for the brand, and she is a Memphis native who recently returned to the Mid-South after attending the University of Arizona. Margo is inspired by street-style, blogs, and Instagram, from both popular and under the radar influencers. She is always on the search for new materials to incorporate into her pieces, and that often dictates her latest designs. She really likes working with an assortment of metal chains, pairing beads of all sizes, and adding pendants for easy layering. The margo.rebecca aesthetic focuses on mixing metals and different colors to create both bold and delicate looks. For instance, the Stephanie is a new, shorter design, and for a longer necklace, the Eloise or Bernice are both very popular. With different chains and bead pairings, the pieces are striking, statement looks in her line. If she has to choose her go-to piece for everyday, she has too many favorites but narrowed it down to two. “I’d pick a simple, everyday piece, such as the Gigi choker with small, clear crystals that seamlessly layers with most necklaces. I also wear my Eve earrings all the time. Kite-shaped with a crystal dangle, they look perfect with most necklaces, but are great alone as well,” Margo said. margo.rebecca jewelry is available at American Threads, Dazzle, Eden Day Spa, Lansky The Accessories Shop and Lansky 126, Walking Pants, and at margorebecca.com. earning a Bachelor of Fine Arts degree, she lived and worked in Arizona and Idaho, where she found inspiration in the two different landscapes. The beautiful surroundings were reflected in her ceramics, paintings, and jewelry designs. “I am a very visual person so my surroundings influence my designs. There’s creativity all around whether it’s nature, art or fashion that give me inspiration,” Dee Dee explained. After experimenting with different mediums, she found her passion in creating jewelry, choosing her family name for her company. 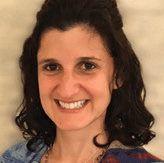 Gauthier designs are created from Dee Dee’s artistic and travel background, and she selects her primary materials depending on what she is designing at the time. “I could be using Italian leather, baroque pearls, or rare gemstones. I like shopping at estate sales, antique stores and international markets finding unusual pieces to showcase current trend designs in my jewelry,” she said. Gauthier is available at Kittie Kyle and Loudean’s; follow Dee Dee on Facebook and Instagram at Gauthier Jewelry. 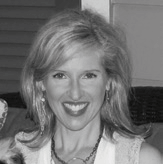 Amy began her career in the financial services industry. After the birth of her daughter, she was able to return to her passion – creating, and, with that, Amy Wells Designs was born. She finds inspiration from the amazing beauty of organic stones, fashion, music (all of her necklaces are named after her favorite songs), and the wonderful women who wear her pieces. Amy works primarily in natural gemstones, freshwater pearls, Thai and sterling silver, and a mixture of metals and fine leather. Amy Wells Designs are available at Sorelle Boutique, Loni’s Fashions, Therapy on the Square in Oxford, MS, as well as numerous boutiques across the country. She can also be found online at amywellsdesigns.com, Facebook, Instagram and Twitter. Myrna Halpern Jewelry designs are laid-back, yet luxurious, and are the epitome of effortless chic. Myrna takes a personal approach to style, and her signature technique is the use of semiprecious gemstones with an ancient Native American bead weaving process. She spends her summers in the Pacific Northwest, and finds inspiration in nature, especially water and mountains. She also studies the runway shows from New York, Paris, London and Milan to keep up with the upcoming trends. Traveling is another great source of inspiration for Myrna. “I recently returned from London where I spent time on Carnaby Street and Bond Street getting a feel for all types of London fashion,” she said. Her pieces are usually crafted of burnished metals with gemstones, pearls, horn and leather, and for Holiday/Resort 2017-18 she is adding some gold-plated metal for extra sparkle. Over the years, she has also collected vintage components she uses to punctuate her designs. A new silhouette Myrna has created for fall is Adya, and is a good example of a statement piece from her line. “I used horn, leather and a variety of gemstones along with vintage scarabs. It is very representative of my look,” Myrna said. A perfect piece from her collection that can be dressy or worn everyday is the Trish tassel necklace, which includes her signature hand woven beading around the top of the tassel. Rather than plastic or glass seed beads, her bead weaving uses actual gemstones in the design. Myrna Halpern Jewelry is available at Oak Hall, Joseph and Kittie Kyle. 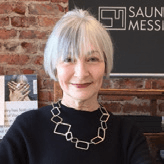 Saundra Messinger is a native Memphian who went on to successes in New York, first with a singing career then as an executive at Eileen Fisher. She began designing jewelry in the summer of 1999, also resulting in much success including a Vogue cover (November, 2007) and editorial coverage in InStyle and the TV show Extra. When asked to describe herself as a designer, Saundra’s reply is simple — taught and inspired by life! Saundra explains that the imperfect geometric shapes found in her work are reminiscent of the sea glass produced by the two rivers she loves, the Mississippi and the Hudson. She is inspired by the morning sunlight shining on a grey river, and her jewelry has a shimmering matte finish and tiny sparkling diamonds – like diamonds on the water – and the organic shapes are reminiscent of sea glass. Primarily her pieces are created from recycled sterling silver in organic shapes with conflict-free diamonds. If Saundra was to suggest a statement piece from her collection, it would be one of the very long chainlinked necklaces that can be worn several ways, or one of her organic shaped rings, or bangles with tiny sparkling diamonds. Another suggestion is a piece she wears everyday: a black leather cuff with a sterling silver clasp that is sprinkled with 13 diamonds. Strong, yet feminine, and exemplifies her entire collection! Saundra Messinger is sold exclusively in Memphis at Kittie Kyle. Join Saundra on July 12th at Kittie Kyle for a champagne party, 4 – 6 pm and see some of her latest and most dramatic statement pieces in the collection. 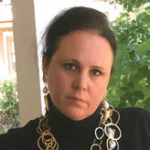 Rebecca grew up in Memphis, and after graduating from Emory University in Atlanta with a business degree, she moved to New York and worked in marketing for a jewelry company, Robert Lee Morris. She decided to continue her formal education in Memphis and enrolled in the Memphis College of Art, where she received her Masters in Fine Arts. She uses her training and expertise in design to build her business with new styles and techniques. 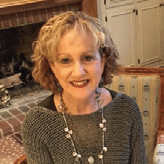 Most of all, she loves living and working in Memphis with her husband and daughter. Rebecca begins the process of creating a new design with a stone, a texture, or a shape. From that point, she says “A story begins to unfold and I let the materials guide the way. The natural inclusions or curve of a stone or pearl dictate what the final piece will look like, but the design evolves during the fabrication.” She enjoys working with one-of-a-kind, semi-precious gemstones, beautiful natural freshwater pearls, and metals such as sterling silver, bronze and copper. When asked if she has a particular statement piece in her line, she suggests that she can design something special and unique for each individual. “My favorite thing to do is create a piece that not only speaks to me as the artist, but I want the wearer to feel something every time she wears it as well.” Rebecca’s favorite piece that she wears almost daily is a boulder opal pendant she made along with a special necklace that was a gift from her husband that represents their daughter. 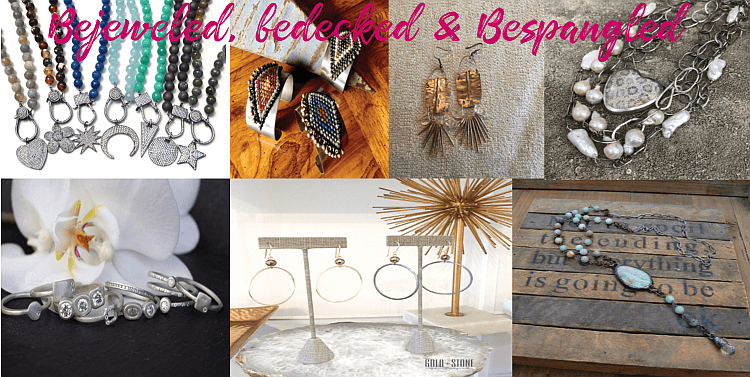 Becca Belz Jewelry is available locally at Lansky 126, Oak Hall, and Joseph plus online at beccabelzjewelry. com. 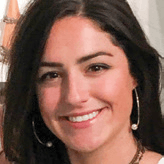 Sophia Margaritis is the creative force behind Gold + Stone. She grew up in Memphis, and attended the University of Arkansas. It was during college that she began making jewelry for herself and friends. 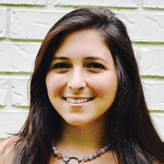 After graduating in 2014, she moved back to the Bluff City to figure out her career path and continued designing jewelry. She was invited by a showroom to present at a market in Atlanta. It was a success and with that, her career and full-time business was created! Sophia has traveled extensively, and seeing the world has influenced her work. It also seems that the pieces she makes for herself always end up being very popular with her clientele. “So, when I am designing new things and get overwhelmed I try to come back to the thought, ‘what would I wear this with?’ I am constantly jotting ideas and sketching things out on the go,” Sophia said. She often uses pyrite, a gorgeous metallic semi-precious gemstone, and it’s one of her favorite elements. She also uses antique and matte finish chains, freshwater pearls, antique charms, and deer hide in many pieces. The Mermaid Lariat is a versatile piece that also makes a bold statement. The Disco Bracelets are another Gold + Stone design that is great for everyday wear, and easy to mix in with other bracelets. Sophia’s Gold + Stone jewelry is available at Sorelle Boutique (also the first retailer to carry her designs), Southern Avenue Company, and at shopgoldandstone. com.